Cois Tine, part of the SMA Justice Office, launched A Journey Together, a unique resource to assist Muslim-Christian cooperation on 16 January 2013. There was a capacity attendance at the launch, by the Deputy Lord Mayor of Cork, Councillor Emmet O’Halloran, in the City Council Chamber of the Cork City Hall. 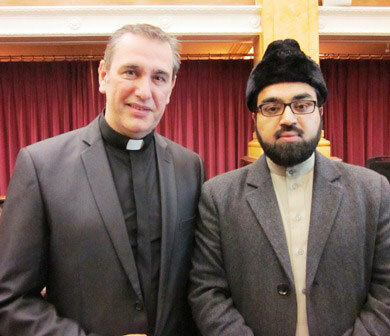 Addressing several Muslim and Christian leaders as well as the general public, Councillor O’Halloran reminded us that Ireland, with 199 different nationalities living in the country, is now clearly a multicultural society, representing a broad diversity of cultures, ethnicities and religions. Engaging positively with this diversity is a crucial and ongoing task for government, both local and national. Playingf its part, the City Council is in the process of drawing up a Cork City Integration Strategy. A production of the SMA Justice Office, it is the fruit of more than two years of research, meetings and workshops and was compiled by Mr Gerry Forde, who has extensive expertise in this field, having worked for many years in the north of Nigeria and Egypt. Gerry has academic qualifications in the area of Islamic Studies from the Pontifical Institute for Arabic & Islamic Studies [PISAI] in Rome, Dar-Comboni Institute in Cairo and has an MA in Islamic Studies from the School of African and Oriental Studies in London. Addressing the guests at the launch, the Provincial Leader of the Society of African Missions, Fr Fachtna O’Driscoll said “So often what we hear about relations between Muslims and Christians is negative and concerns violence and intolerance. Yet here tonight the focus is very much on the cooperation, mutual understanding and respect things that are at the core of interfaith dialogue. The process that led to the existence of this resource is testament to the fact that this cooperation and respect is possible.” Read Fr O’Driscoll’s text here. He further explained that if people are looking for more information about Islam or Christianity, very often the books available denigrate the other faith. But A Journey Together does not do this. 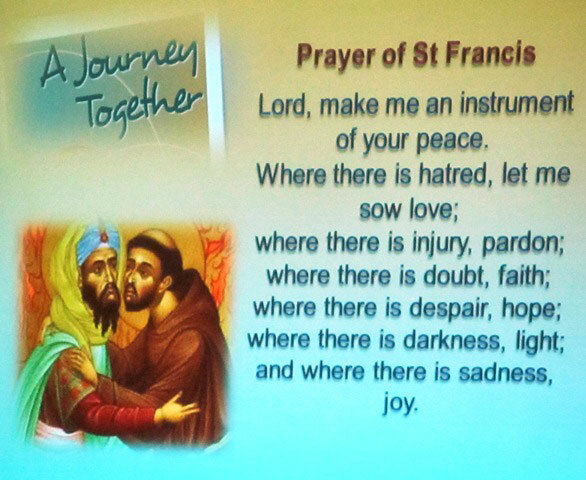 Following the addresses there was a common prayer moment at which different guests prayed and spoke on different aspects of the Prayer of St Francis – Lord, make me an instrument of your Peace. Bishops John Buckley and Bishop Paul Colton led some of the prayers along with some members of the Islamic faith. Afterwards refreshments and vegetarian food was able for all.